Our fantastic 2019 Toyota Camry SE Sedan offered in amazing Galactic Aqua Mica. Powered by a proven 2.5 Liter 4 Cylinder that extends 203hp while mated with an innovative 8 Speed electronically controlled Automatic transmission. Emulating driving passion while providing near 39mpg on the open highway, you will be impressed with the powerful acceleration and handling of this Front Wheel Drive Camry. Athletic and gracefully, the exterior of the Camry is accented by a sultry, seductive shape. You will be immediately attracted to the black front grille with sport mesh insert, alluring 18-inch black machined-finish alloy wheels, and rear spoiler. Slide into the comfortable Sport SofTex trimmed seats as you savor ergonomically designed features including a 7-inch touch-screen display, Entune 3.0 Audio with connected Navigation and App Suite, Bluetooth, and an excellent six-speaker sound system with steering wheel mounted controls. You will also appreciate remote keyless entry, cruise control, a rearview camera, a tilt-and-telescoping steering wheel, and split-folding rear seats. Stunning looks, fantastic handling, the newest technology, and the roomy interior make this Camry an absolute joy to own. Toyota offers anti-lock brakes with brake assist, stability control, and an army of airbags that combine to safeguard you in this impeccable Camry with a sterling reputation for reliability. Enjoy this smooth, quiet ride! Print this page and call us Now... We Know You Will Enjoy Your Test Drive Towards Ownership! 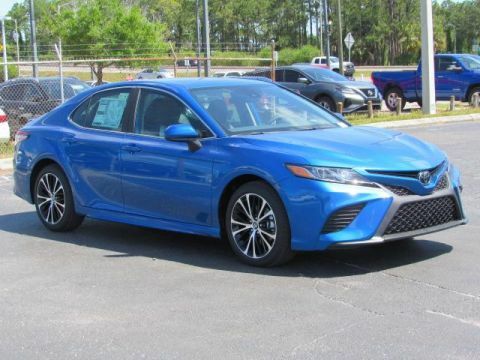 Our fantastic 2019 Toyota Camry SE Sedan offered in amazing Blue Streak Metallic. Powered by a proven 2.5 Liter 4 Cylinder that extends 203hp while mated with an innovative 8 Speed electronically controlled Automatic transmission. Emulating driving passion while providing near 39mpg on the open highway, you will be impressed with the powerful acceleration and handling of this Front Wheel Drive Camry. Athletic and gracefully, the exterior of the Camry is accented by a sultry, seductive shape. You will be immediately attracted to the black front grille with sport mesh insert, alluring 18-inch black machined-finish alloy wheels, and rear spoiler. Slide into the comfortable Sport SofTex trimmed seats as you savor ergonomically designed features including a 7-inch touch-screen display, Entune 3.0 Audio with connected Navigation and App Suite, Bluetooth, and an excellent six-speaker sound system with steering wheel mounted controls. You will also appreciate remote keyless entry, cruise control, a rearview camera, a tilt-and-telescoping steering wheel, and split-folding rear seats. Stunning looks, fantastic handling, the newest technology, and the roomy interior make this Camry an absolute joy to own. Toyota offers anti-lock brakes with brake assist, stability control, and an army of airbags that combine to safeguard you in this impeccable Camry with a sterling reputation for reliability. Enjoy this smooth, quiet ride! Print this page and call us Now... We Know You Will Enjoy Your Test Drive Towards Ownership! Our fantastic 2019 Toyota Camry SE Sedan offered in amazing Galactic Aqua Mica. Powered by a proven 2.5 Liter 4 Cylinder that extends 203hp while mated with an innovative 8 Speed electronically controlled Automatic transmission. Emulating driving passion while providing near 39mpg on the open highway, you will be impressed with the powerful acceleration and handling of this Front Wheel Drive Camry. Athletic and gracefully, the exterior of the Camry is accented by a sultry, seductive shape. You will be immediately attracted to the black front grille with sport mesh insert, alluring 18-inch black machined-finish alloy wheels, and rear spoiler. Slide into the comfortable Sport SofTex trimmed seats in our SE as you savor ergonomically designed features including a 7-inch touch-screen display, Entune 3.0 Audio with connected Navigation and App Suite, Bluetooth, and an excellent six-speaker sound system with steering wheel mounted controls. You will also appreciate remote keyless entry, cruise control, a rearview camera, a tilt-and-telescoping steering wheel, and split-folding rear seats. Stunning looks, fantastic handling, the newest technology, and the roomy interior make this Camry an absolute joy to own. Toyota offers anti-lock brakes with brake assist, stability control, and an army of airbags that combine to safeguard you in this impeccable Camry with a sterling reputation for reliability. Enjoy this smooth, quiet ride! Print this page and call us Now... We Know You Will Enjoy Your Test Drive Towards Ownership! 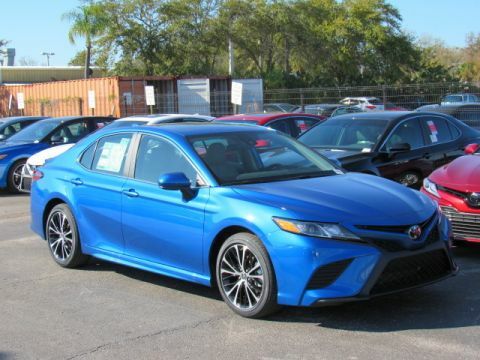 Load up the family and enjoy our fantastic 2019 Toyota Camry SE Sedan offered in amazing Blue Streak Metallic. Powered by a proven 2.5 Liter 4 Cylinder that extends 203hp while mated with an innovative 8 Speed electronically controlled Automatic transmission. Emulating driving passion while providing near 39mpg on the open highway, you will be impressed with the powerful acceleration and handling of this Front Wheel Drive Camry. Athletic and gracefully, the exterior of the Camry is accented by a sultry, seductive shape. You will be immediately attracted to the black front grille with sport mesh insert, alluring 18-inch black machined-finish alloy wheels, and rear spoiler. Slide into the comfortable Sport SofTex trimmed seats in our SE as you savor ergonomically designed features including a 7-inch touch-screen display, Entune 3.0 Audio with connected Navigation and App Suite, Bluetooth, and an excellent six-speaker sound system with steering wheel mounted controls. You will also appreciate remote keyless entry, cruise control, a rearview camera, a tilt-and-telescoping steering wheel, and split-folding rear seats. Stunning looks, fantastic handling, the newest technology, and the roomy interior make this Camry an absolute joy to own. Toyota offers anti-lock brakes with brake assist, stability control, and an army of airbags that combine to safeguard you in this impeccable Camry with a sterling reputation for reliability. Enjoy this smooth, quiet ride! Print this page and call us Now... We Know You Will Enjoy Your Test Drive Towards Ownership! 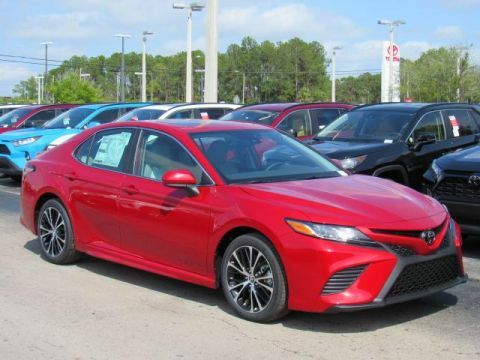 Embrace driving pleasure in our 2019 Toyota Camry SE Sedan offered in amazing Supersonic Red. Powered by a proven 2.5 Liter 4 Cylinder that extends 203hp while mated with an innovative 8 Speed electronically controlled Automatic transmission. Emulating driving passion while providing near 39mpg on the open highway, you will be impressed with the powerful acceleration and handling of this Front Wheel Drive Camry. Athletic and gracefully, the exterior of the Camry is accented by a sultry, seductive shape. You will be immediately attracted to the black front grille with sport mesh insert, alluring 18-inch black machined-finish alloy wheels, prominent sunroof, and rear spoiler. Slide into the comfortable Sport SofTex trimmed seats as you savor ergonomically designed features including a 7-inch touch-screen display, Entune 3.0 Audio with connected Navigation and App Suite, Bluetooth, and an excellent six-speaker sound system with steering wheel mounted controls. You will also appreciate remote keyless entry, cruise control, a rearview camera, a tilt-and-telescoping steering wheel, and split-folding rear seats. Stunning looks, fantastic handling, the newest technology, and the roomy interior make this Camry an absolute joy to own. Toyota offers anti-lock brakes with brake assist, stability control, and an army of airbags that combine to safeguard you in this impeccable Camry with a sterling reputation for reliability. Enjoy this smooth, quiet ride! Print this page and call us Now... We Know You Will Enjoy Your Test Drive Towards Ownership! 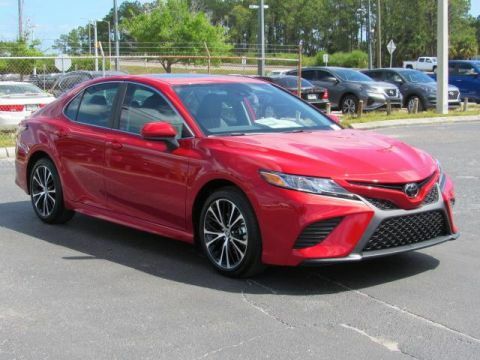 Our fantastic 2019 Toyota Camry SE Sedan offered in amazing Supersonic Red. Powered by a proven 2.5 Liter 4 Cylinder that extends 203hp while mated with an innovative 8 Speed electronically controlled Automatic transmission. 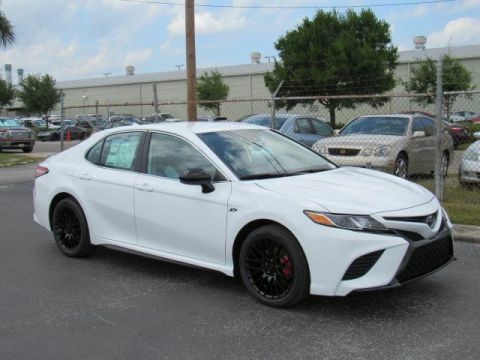 Emulating driving passion while providing near 39mpg on the open highway, you will be impressed with the powerful acceleration and handling of this Front Wheel Drive Camry. Athletic and gracefully, the exterior of the Camry is accented by a sultry, seductive shape. You will be immediately attracted to the black front grille with sport mesh insert, alluring 18-inch black machined-finish alloy wheels, and rear spoiler. Slide into the comfortable Sport SofTex trimmed seats in our SE as you savor ergonomically designed features including a 7-inch touch-screen display, Entune 3.0 Audio with connected Navigation and App Suite, Bluetooth, and an excellent six-speaker sound system with steering wheel mounted controls. You will also appreciate remote keyless entry, cruise control, a rearview camera, a tilt-and-telescoping steering wheel, and split-folding rear seats. Stunning looks, fantastic handling, the newest technology, and the roomy interior make this Camry an absolute joy to own. Toyota offers anti-lock brakes with brake assist, stability control, and an army of airbags that combine to safeguard you in this impeccable Camry with a sterling reputation for reliability. Enjoy this smooth, quiet ride! Print this page and call us Now... We Know You Will Enjoy Your Test Drive Towards Ownership! 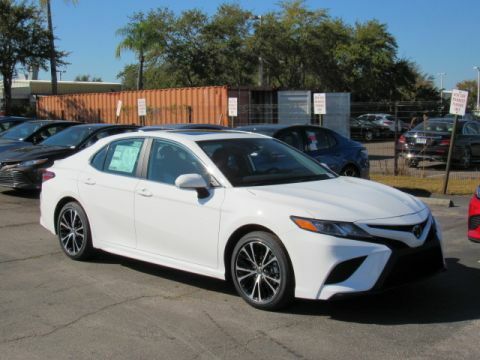 Load up the family and enjoy our fantastic 2019 Toyota Camry SE Sedan offered in amazing Super White. Powered by a proven 2.5 Liter 4 Cylinder that extends 203hp while mated with an innovative 8 Speed electronically controlled Automatic transmission. 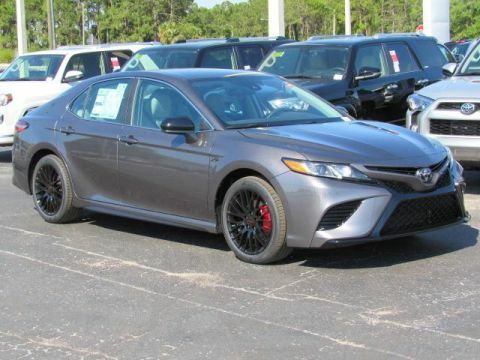 Emulating driving passion while providing near 39mpg on the open highway, you will be impressed with the powerful acceleration and handling of this Front Wheel Drive Camry. Athletic and gracefully, the exterior of the Camry is accented by a sultry, seductive shape. You will be immediately attracted to the black front grille with sport mesh insert, alluring 18-inch black machined-finish alloy wheels, and rear spoiler. Slide into the comfortable Sport SofTex trimmed seats in our SE as you savor ergonomically designed features including a 7-inch touch-screen display, Entune 3.0 Audio with connected Navigation and App Suite, Bluetooth, and an excellent six-speaker sound system with steering wheel mounted controls. You will also appreciate remote keyless entry, cruise control, a rearview camera, a tilt-and-telescoping steering wheel, and split-folding rear seats. Stunning looks, fantastic handling, the newest technology, and the roomy interior make this Camry an absolute joy to own. Toyota offers anti-lock brakes with brake assist, stability control, and an army of airbags that combine to safeguard you in this impeccable Camry with a sterling reputation for reliability. Enjoy this smooth, quiet ride! Print this page and call us Now... We Know You Will Enjoy Your Test Drive Towards Ownership! 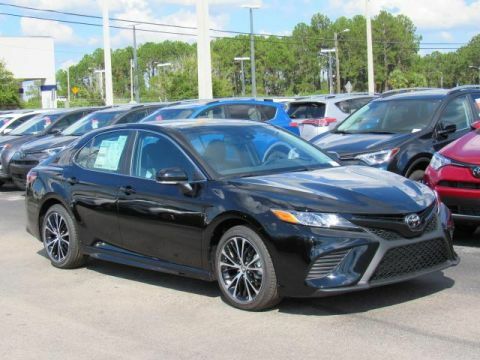 Adding some driving pleasure to your day with our fantastic 2018 Toyota Camry SE Sedan offered in amazing Midnight Black Metallic! Powered by a proven 2.5 Liter 4 Cylinder that offers 203hp while paired with an innovative 8 Speed electronically controlled Automatic transmission. Emulating driving passion while providing near 39mpg on the open highway, you will be impressed with the powerful acceleration and handling of this Front Wheel Drive Camry. The exterior is accented by its sleek shape, black front grille with a sporty mesh insert, distinct black machined-finish alloy wheels, and unique rear spoiler. Slide into the comfortable Sport SofTex trimmed seats as you savor ergonomically designed features including a 7-inch touch-screen display, Entune 3.0 Audio with connected Navigation and App Suite, Bluetooth, and an excellent six-speaker sound system with steering wheel mounted controls. You will also appreciate remote keyless entry, cruise control, a rearview camera, a tilt-and-telescoping steering wheel and split-folding rear seats. Stunning looks, fantastic handling, the newest technology and the roomy interior make this Camry an absolute joy to own. Camry offers anti-lock brakes with brake assist, stability control, and an army of airbags that combine to safeguard you in this impeccable Toyota with a sterling reputation for reliability. Enjoy this smooth, quiet ride! Print this page and call us Now... We Know You Will Enjoy Your Test Drive Towards Ownership! Our fantastic 2019 Toyota Camry SE Sedan offered in amazing Super White. Powered by a proven 2.5 Liter 4 Cylinder that extends 203hp while mated with an innovative 8 Speed electronically controlled Automatic transmission. 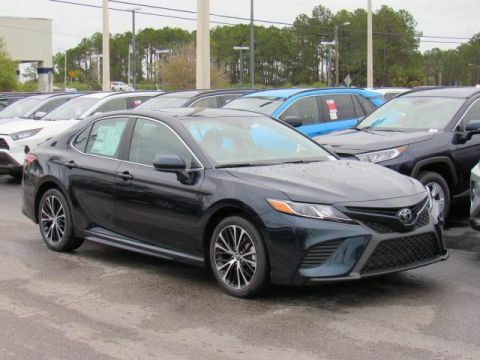 Emulating driving passion while providing near 39mpg on the open highway, you will be impressed with the powerful acceleration and handling of this Front Wheel Drive Camry. Athletic and gracefully, the exterior of the Camry is accented by a sultry, seductive shape. You will be immediately attracted to the black front grille with sport mesh insert, alluring 18-inch black machined-finish alloy wheels, and rear spoiler. Slide into the comfortable Sport SofTex trimmed seats as you savor ergonomically designed features including a 7-inch touch-screen display, Entune 3.0 Audio with connected Navigation and App Suite, Bluetooth, and an excellent six-speaker sound system with steering wheel mounted controls. You will also appreciate remote keyless entry, cruise control, a rearview camera, a tilt-and-telescoping steering wheel, and split-folding rear seats. Stunning looks, fantastic handling, the newest technology, and the roomy interior make this Camry an absolute joy to own. Toyota offers anti-lock brakes with brake assist, stability control, and an army of airbags that combine to safeguard you in this impeccable Camry with a sterling reputation for reliability. Enjoy this smooth, quiet ride! Print this page and call us Now... We Know You Will Enjoy Your Test Drive Towards Ownership! Our fantastic 2019 Toyota Camry SE Sedan offered in amazing Predawn Gray Mica. Powered by a proven 2.5 Liter 4 Cylinder that extends 203hp while mated with an innovative 8 Speed electronically controlled Automatic transmission. 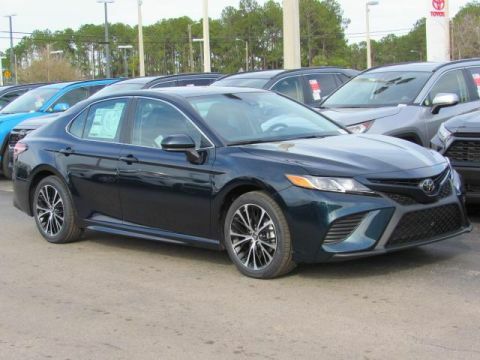 Emulating driving passion while providing near 39mpg on the open highway, you will be impressed with the powerful acceleration and handling of this Front Wheel Drive Camry. Athletic and gracefully, the exterior of the Camry is accented by a sultry, seductive shape. You will be immediately attracted to the black front grille with sport mesh insert, alluring 18-inch black machined-finish alloy wheels, and rear spoiler. Slide into the comfortable Sport SofTex trimmed seats in our SE as you savor ergonomically designed features including a 7-inch touch-screen display, Entune 3.0 Audio with connected Navigation and App Suite, Bluetooth, and an excellent six-speaker sound system with steering wheel mounted controls. You will also appreciate remote keyless entry, cruise control, a rearview camera, a tilt-and-telescoping steering wheel, and split-folding rear seats. Stunning looks, fantastic handling, the newest technology, and the roomy interior make this Camry an absolute joy to own. Toyota offers anti-lock brakes with brake assist, stability control, and an army of airbags that combine to safeguard you in this impeccable Camry with a sterling reputation for reliability. Enjoy this smooth, quiet ride! Print this page and call us Now... We Know You Will Enjoy Your Test Drive Towards Ownership! Our midsize truck can do it all! 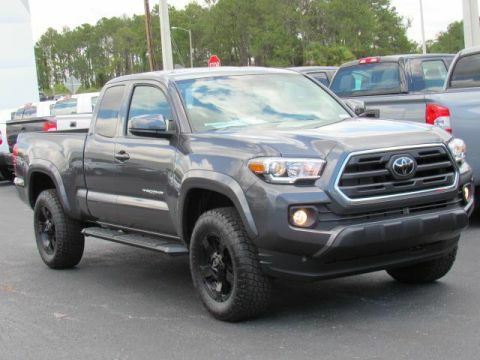 Our 2018 Toyota Tacoma SR5 Access Cab 4X2 stands out in Magnetic Gray Metallic as a road-ready workhorse! Powered by a 3.5 Liter V6 that offers 278hp while matched to a 6 Speed Automatic transmission for fantastic passing. You'll be impressed with brisk acceleration, or our Rear Wheel Drive has the power to tow and haul, and near 24mpg on the open road in this confident truck. Our SR5 is primed to work with a deck rail system, muscular fenders, fog lights, and a stylish charcoal front grille with chrome accents. The well-designed cabin puts you in command with keyless entry, fabric-trimmed seats, a multi-information display, power windows/locks, and an integrated backup camera. Entune Audio Plus with Connected Navigation App, available satellite radio, and HD radio keeps you in-the-know and entertained along the way. Safety with Toyota is optimized behind the wheel with the toughness you expect. Tacoma features a high strength steel construction and advanced safety features such as a tire pressure monitoring system, vehicle stability control, and smart stop technology. Thrive on the drive...get in our Tacoma! Print this page and call us Now... We Know You Will Enjoy Your Test Drive Towards Ownership! 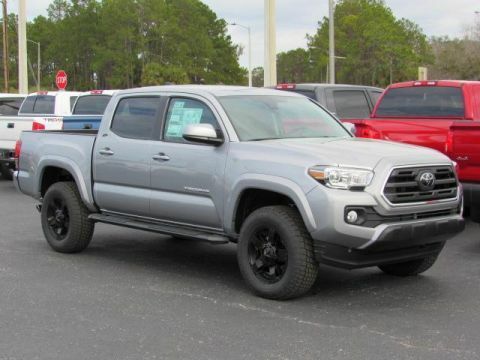 Our 2019 Toyota Tacoma SR5 Double Cab 4X2 stands out in Silver Sky Metallic! Powered by a proven 3.5 Liter V6 that offers 278hp while matched to a 6 Speed Automatic transmission to offer supreme road authority. You'll be impressed with brisk acceleration or our Rear Wheel Drive that provides the power to tow and haul, and near 24mpg on the open road in this confident truck. Our SR5 is primed to work with a deck rail system, muscular fenders, fog lights, and a stylish charcoal front grille with chrome accents. The well-designed SR5 cabin puts you in command with keyless entry, fabric-trimmed seats, a multi-information display, power windows/locks, and an integrated backup camera. Entune Audio Plus with Connected Navigation App, available satellite radio, and HD radio keeps you in-the-know and entertained along the way. Safety is optimized behind the wheel with the toughness you expect from Toyota. 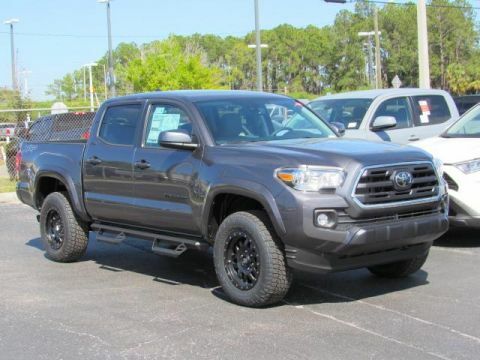 Tacoma features a high strength steel construction and advanced safety features such as a tire pressure monitoring system, vehicle stability control, and smart stop technology. Thrive on the drive...get in our Tacoma! Print this page and call us Now... We Know You Will Enjoy Your Test Drive Towards Ownership! 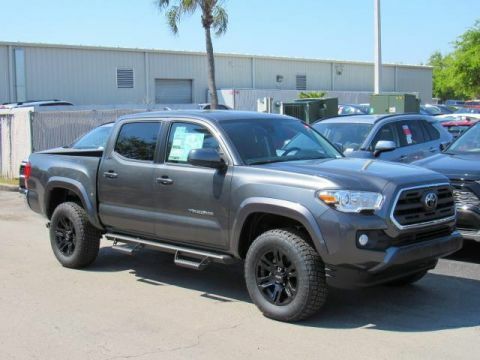 Our 2019 Toyota Tacoma SR5 Double Cab 4X2 stands out in Magnetic Gray Metallic! Powered by a proven 3.5 Liter V6 that offers 278hp while matched to a 6 Speed Automatic transmission to offer supreme road authority. You'll be impressed with brisk acceleration or our Rear Wheel Drive that provides the power to tow and haul, and near 24mpg on the open road in this confident truck. Our SR5 is primed to work with a deck rail system, muscular fenders, fog lights, and a stylish charcoal front grille with chrome accents. The well-designed SR5 cabin puts you in command with keyless entry, fabric-trimmed seats, a multi-information display, power windows/locks, and an integrated backup camera. Entune Audio Plus with Connected Navigation App, available satellite radio, and HD radio keeps you in-the-know and entertained along the way. Safety is optimized behind the wheel with the toughness you expect from Toyota. Tacoma features a high strength steel construction and advanced safety features such as a tire pressure monitoring system, vehicle stability control, and smart stop technology. Thrive on the drive...get in our Tacoma! Print this page and call us Now... We Know You Will Enjoy Your Test Drive Towards Ownership! 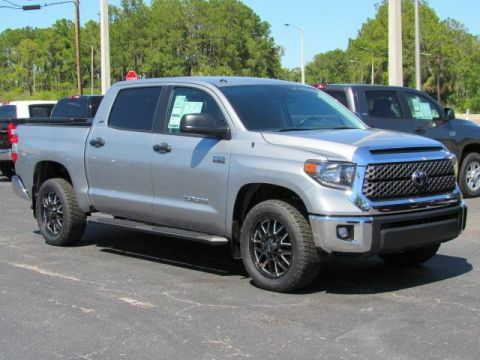 Tackle every challenge in our 2019 Toyota Tundra SR5 CrewMax 4X2 brought to you in Silver Sky Metallic! Powered by an impressive 5.7 Liter iForce V8 offering 381hp while mated to a responsive 6 Speed Automatic transmission. This Rear Wheel Drive combination yields near 18mpg on the open road and does so with style! Check out the brawny chrome grille surround, fog lights, easy lower and lift tailgate, and daytime running lights of our SR5 that allow you to command the road. The SR5 interior has been well-designed to help you work smarter with thoughtful touches perfectly in place. Power windows/locks, keyless entry, and intermittent wipers are just a few amenities you can expect. Maintain next-level connectivity while behind the wheel thanks to our Entune Audio Plus with Connected Navigation App. It includes a high-resolution touchscreen display, AM/FM/CD/MP3/WMA, USB, advanced voice recognition, an integrated backup camera, Bluetooth, available satellite radio and more! Toyota has received exemplary safety scores thanks to advanced features including a multitude of airbags, anti-lock brakes, and trailer sway control. You deserve a truck with a reputation for reliability and quality. Get behind the wheel of this Tundra SR5 today! Print this page and call us Now... We Know You Will Enjoy Your Test Drive Towards Ownership! 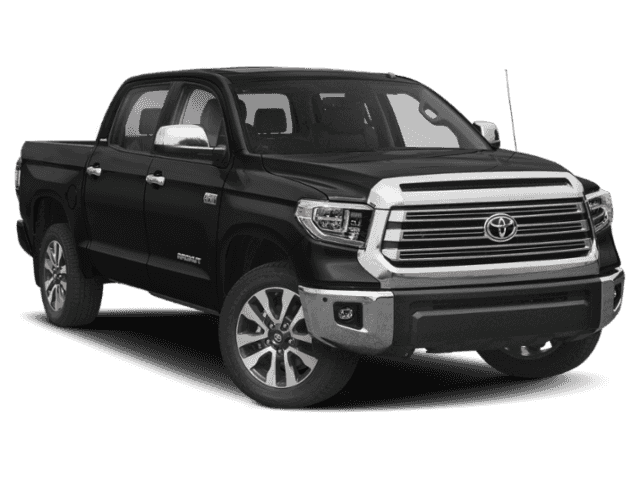 Take a look at our 2019 Toyota Tundra SR5 CrewMax 4X4 brought to you in Midnight Black Metallic! Powered by an impressive 5.7 Liter iForce V8 offering 381hp while mated to a responsive 6 Speed Automatic transmission for impressive towing or passing power. This Four Wheel Drive combination yields near 18mpg on the open road and does so with style! Check out the chrome grille surround, fog lights, easy lower and lift tailgate, and daytime running lights of our SR5 that allow you to command the road. The SR5 interior has been well-designed to help you work smarter with thoughtful touches perfectly in place. Power windows/locks, keyless entry, and intermittent wipers are just a few amenities you can expect. Maintain next-level connectivity while behind the wheel thanks to our Entune Audio Plus with Connected Navigation App. It includes a high-resolution touchscreen display, AM/FM/CD/MP3/WMA, USB, advanced voice recognition, an integrated backup camera, Bluetooth, available satellite radio and more! Toyota has received exemplary safety scores thanks to advanced features including a multitude of airbags, anti-lock brakes, and trailer sway control. You deserve a truck with a reputation for reliability and quality. Get behind the wheel of this Tundra SR5 today! Print this page and call us Now... We Know You Will Enjoy Your Test Drive Towards Ownership!